What is Orgonite and its Benefits? Wilhelm Reich discovered the existence of orgone life energy in the 1930s. What he had discovered was a cosmic omnipresent energy too subtle to be measured with instruments at that time. To-day the energy fields can be measured. These are subtle etheric energies that are found everywhere – from within the human body to the air around us – it is in the building blocks of all life on earth. Many healing methods make use of these subtle energies to heal imbalances in the body. It is a force field around everyone. It protects you from the toxic environment from all the micro, hi-fi waves, wireless devices and video games & much, much more. It knocks radiation out of the sky for kilometers away. These scalar waves are healing and revitalizing – your animals will also be attracted to and benefit from them. It penetrates matter using scalar technology waves, but at different speeds. It pulsates and is observable, measurable and can be photographed. Blocks out mental distractive waves. Clears the air of chemtrails for a kilometer all round it. It knocks out the radiation from outside one’s house – Keeping the heavy metals away from you and your family. It will protect your home from chemtrails with one in the front garden or at the front door and one in the back yard or at the back door. Protects from harmful toxic EMF frequencies – electromagnetic frequencies like your cell phone, wi-fi, wi-fi game controllers, your microwave, smart appliances, smart anything. Organic materials attract and hold orgone energy. It’s an energy frequency related to inner and outer space. It has a strong affinity and attraction to water. It is accumulated naturally in living organism through the ingesting of foods, breathing, and through the skin. 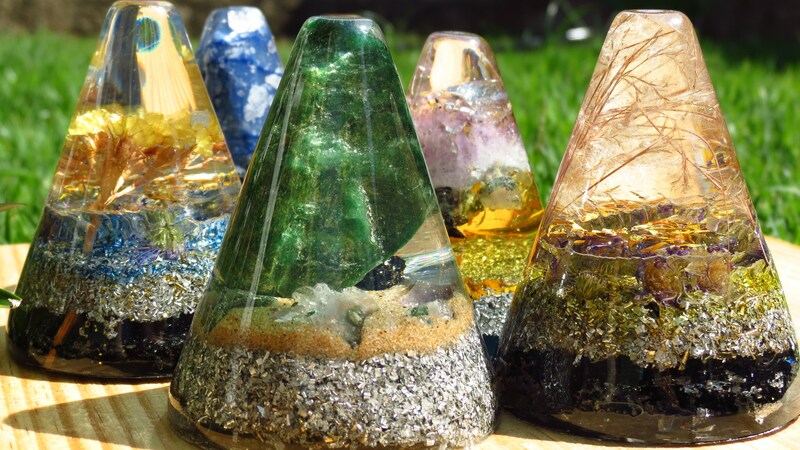 Orgonite is a substance made today of organic resin, metals (most metals are natural) and at least one quartz crystal that strengthens the body’s etheric energy field. This field is connected to the physical body and receives energy frequencies from the sun to strengthen it. It then transfers that strength to the physical body helping to protect you from man-made EMF radiation and other negative energy. Orgonite can help improve your life physically, emotionally and mentally. What are other the benefits of orgonite? Better and deeper sleep allowing the body to heal itself. Balanced moods if these are a result of external influences. Increased resistance to bad bacteria and viruses entering the body. Seeds sprout more quickly and stronger. Deepen meditation and prayer.Boost all plant growth and helps vegetables and flowers to grow healthier. Remove negative energy in a specific place. Purify and structure water to drink and use generally. Food will last longer in the fridge. Kirlian photography is a technique that shows the pattern and brightness of an object’s energy. What does this Kirlian Photo of Orgonite Mean? As you can see, gold orgonite has a powerful and bright aura, which is why certain manufacturers use gold in many of their pieces. However, most orgonite-makers will tell you that using mixed metals in orgonite provides a good result. Different metals also have different “feels”. Many people report that aluminium orgonite has a light, airy feeling, copper feels more grounding, and gold adds a lovely soft feeling to the orgonite. Truth to tell, there is no wrong or right when it comes to metals in orgonite. Many people find aluminium the best to use for pendants, since it is lighter than copper. However, others usually add in some brass since they have access to fine brass shavings (the size of the metals makes a difference – small shavings have a smaller “reach”, but are more effective in converting negative energy. For the best pendants, some mix small shavings with slightly larger ones to cover both reach and effectiveness. And for the ultimate pendant, the addition of gold flakes not only looks stunning, but adds a lovely feel to the pendant too! The Benefits of Negative Ions from orgonite. When we inhale negative ions, they produce a biochemical reaction in our body that makes our brain increase its serotonin levels. Serotonin is the neurotransmitter which is responsible for alleviating stress and depression, and promoting a feeling of well-being. Negative ions clean the air. A study by the US department of Agriculture found that ionising a room led to 52% less dust and 95% less bacteria in the air. This is because negative ions are attracted to floating particles in the air, and when they fuse they become too heavy to stay airborne, meaning that those particles can now be swept or vacuumed off the floor. Negative ions have been shown to improve high blood pressure, asthma and hay fever. Negative ions increase the flow of oxygen to the brain, making us feel more alert and giving us more mental energy. Research done at Columbia University showed that people who suffered from SAD (Seasonal Affective Disorder) and chronic depression, experienced just as much relief from negative ion generators as they did with prescription antidepressants, but without the notorious side effects of antidepressant medication. The metabolic processes that occur in our cells are boosted by negative ions, making our cells more efficient at absorbing nutrients and expelling toxins. ⟵What is the science behind frequency healing?